Lekture "Secrets of the St. Ephrosinia the Savior Orthodox Nunnery : findings and discoveries of the field season 2018"
The Museum of Local Lore in Polotsk will host a lecture by the Master of Historical Sciences, Senior Lecturer of the Department of History and Tourism at Polotsk State University, Alexei Leonidovich Kots, "Secrets of the St. Ephrosinia the Savior Orthodox Nunnery : findings and discoveries of the field season 2018". Alexey Leonidovich has been the head of the excavations, which are held on the territory of the St. Ephrosinia the Savior Orthodox Nunnery for years. Each excavation season is a new discovery and the 2018 season is no exception. 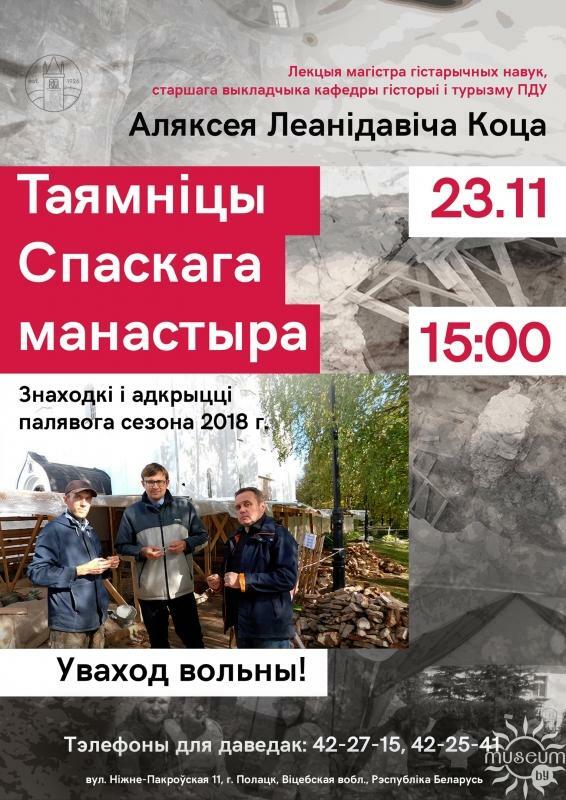 Polotsk archeologist is willing to share the results of his research with the guests of the event at our museum on the 23 of November at 3:00 pm. We are waiting for you at the lecture!